The six-year veteran is just the second tight end in NFL history to tally three-straight 1,000-yard campaigns, joining Greg Olsen. Fellow tight end Demetrius Harris also found the end zone through the air on Sunday, as Mahomes found the six-foot-seven Harris for a 13-yard score late in the third quarter. The touchdown was preceded by the Chiefs’ third fumble recovery of the day, with forced fumbles courtesy of cornerback Kendall Fuller, defensive end Allen Bailey and defensive tackle Jarvis Jenkins. Each takeaway helped Kansas City hold Oakland to just 16 points as the fourth quarter got underway, but the Raiders strung together a pair of unanswered touchdowns to narrow the deficit to three with just under seven minutes remaining. 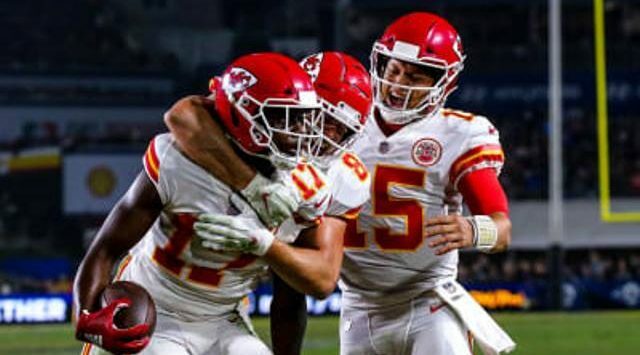 Mahomes and the Kansas City offense answered, however, with a 75-yard drive culminating in a 2-yard scoring pass to wide receiver Chris Conley that effectively sealed the victory. It marked Mahomes’ league-leading 41st touchdown pass of the year – tied for the second-most through Week 13 in NFL history – and helped Kansas City secure a double-digit win total for a fourth-straight season. The Chiefs return to Arrowhead Stadium next Sunday to take on the Baltimore Ravens.